As usual I've been reading an eclectic mix of books these past few months, and I'm sharing my thoughts on quite a few of them today. Edie Wadsworth's memoir, All the Pretty Things, is scheduled to release on September 20, however I received a free digital version of the book as part of the launch team online book club that's reading and discussing the book this month. This is a very moving story about Edie growing up with an alcoholic father who she loved and her desire to make him proud. The poverty and family dynamics surrounding Edie's early life are tough stories, yet somehow she sees it all through rose-colored glasses, making this memoir easy to read despite the difficult situations. She looks back with a forgiving heart while also being honest about the hurt and disappointment that often resulted when her father didn't show up or showed up drunk at various times in her life. I highly recommend this book if you enjoy memoirs and true stories of individuals overcoming difficult situations. I read and enjoyed the first book in the 5th Wave series earlier this year (check out my review here). The second book, The Infinite Sea, continues the story of Cassie and the other main characters from the first book. However, the focus of the story shifts between various characters and is somewhat difficult to follow. I did learn the back stories of Ringer and Poundcake, yet for over half the book I was left wondering if most of the others were even still alive. This book also left me wondering which characters to trust and somewhat confused about the nanotechnology and its part in the story. I did not enjoy this book as much as the first one, however it did end in a way that makes me want to read book three and find out more about the alien invasion and who is actually still human! A few years ago I read (and reviewed here) Mr. Penumbra's 24-Hour Bookstore, a great book with mystery and books and strange characters. Ajax Penumbra 1969 is a Kindle Single short story about how Ajax found the bookstore in the first place. It's a FUN read with a great scene as Ajax tries to find an old book in a sunken ship that's been somewhat uncovered by the new subway tunnel being built. The ship was once a bookstore! Kitchens of the Great Midwest by J. Ryan Stradal is a novel about a girl named Eva, whose mother left when she was a few weeks old. Her father died shortly after and she was raised by her aunt and uncle. Her story is told from the perspectives of different people throughout her life as she grows up and becomes a renowned chef offering once-in-a-lifetime experiences. This is a good book, although some chapters have quite a bit of bad language. The ending was OK, but the main relationship issue (between Eva and her mother) was not resolved. My friend Minetta loaned me her copy of The Selected Journals of L.M. Montgomery, Vol. 1: 1889-1910. This thick volume begins when L.M. Montgomery was 14-years-old and concludes a couple of years after Anne of Green Gables was first published when she was 34-years-old. 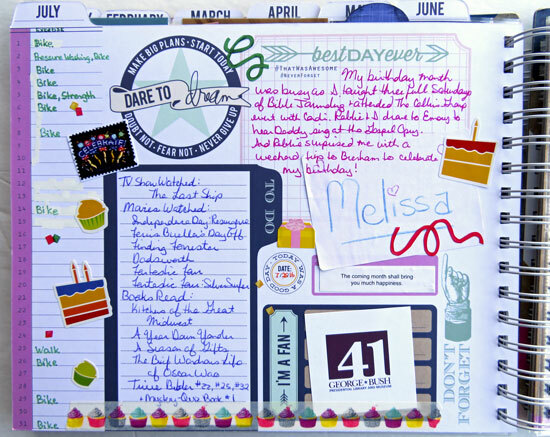 Because these are her personal journal entries, there are lots of little details that are left out and many individuals who come and go in her life. However, it was an extremely interesting read and she seemed to be a happy and carefree young girl and enjoyed a very busy social life as a young lady. Her descriptions of Prince Edward Island are lovely and the way she so vividly portrays Prince Edward Island in the Anne books is evident early on in her journals. I enjoyed reading about her Cavendish school years, her teacher training and the years she taught in several schools. In her mid-20s, she became engaged and almost immediately regretted the decision. The tone of her journaling changes from this point and she begins to have episodes of depression and does lots of "groaning" to her journal, especially during the long winter months. She eventually breaks off the engagement, but then her Grandfather dies and she must live with her Grandmother in order for her Grandmother to stay in the family home. These years are difficult for her, yet she was still outwardly happy and jovial. She meets her future husband during this time and they become engaged with the understanding that she will stay with her Grandmother and the marriage may be several years away. Beginning in her late teens, she began to have poems and stories published in magazines and was quite prolific during her 20s and early 30s. After Anne of Green Gables was published, she lamented to her journal that she could finally afford to enjoy a few of the finer things in life, yet she was trapped having to stay with her Grandmother who wouldn't allow her to provide any luxuries. Volume I ends with her writing the second Anne book, wondering what life will be like when her Grandmother is gone and she is married to a minister. I enjoyed reading this volume, despite the fact that it's a slow read and the later entries are filled with depressing days. It was so interesting to see her writing style improve and to read some of the early passages that show she drew on many of her own experiences for the story of Anne Shirley. The library book club starts up again next month, and the first selection is The Nightingale by Kristin Hannah. This is an excellent novel set in France during World War II. It's the story of two sisters who endure the hardships of war in very different ways. The book actually starts in modern day Oregon as one of the sisters looks back on her life, however it isn't until much later in the book when it's obvious which sister it is. I thoroughly enjoyed this page-turner and finished it in two days! Gossamer Ghost is the 12th book in the Scrapbooking Mystery series by Laura Childs. I've read the first 11 books and picked this one up when I noticed it on the library shelves several weeks ago. It was OK, although the plot lines in this series are so similar that it was a little boring. It was also strange because the main character, Carmela Bertrand, was terribly frightened when she discovered a dead body . . . despite the fact that this is the 12th dead body she's found! As usual there were lots of suspects, however in this book Carmela does not figure out who the murderer is until that person pulls a gun on her and Ava near the end of the book. Have you read any of these books? Are there any that you're adding to your list of books-to-read? The Day 7 challenge in The 20 Project class was to use landscape and portrait orientation photos together on a layout . . . happily. If you follow Shimelle, you know that she typically uses photos that are the same orientation, so it was FUN to watch her put together a video using two different photos. 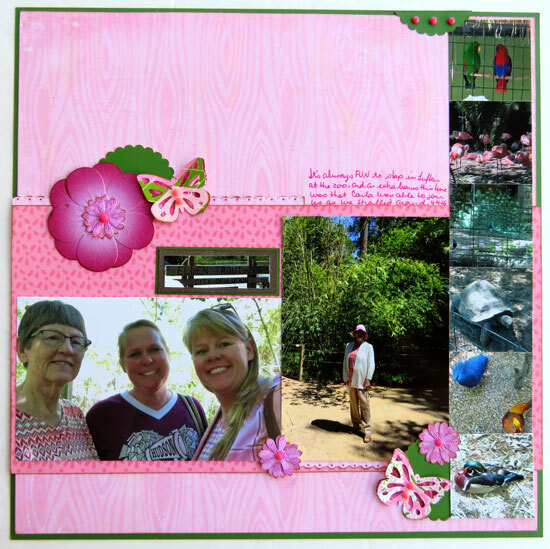 For my layout, I ended up using one landscape photo, one portrait photo, and six small square photos from a visit to the zoo in Lufkin earlier this year. 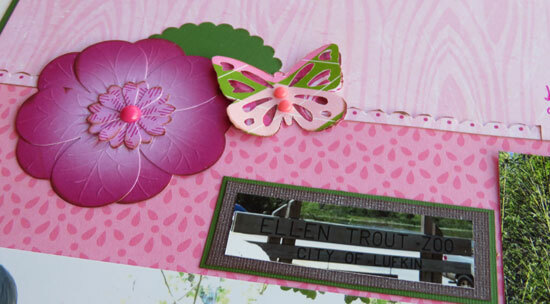 I created two little embellishment clusters and used the photo of the sign as my title block. Do you combine portrait and landscape photos on your layouts? 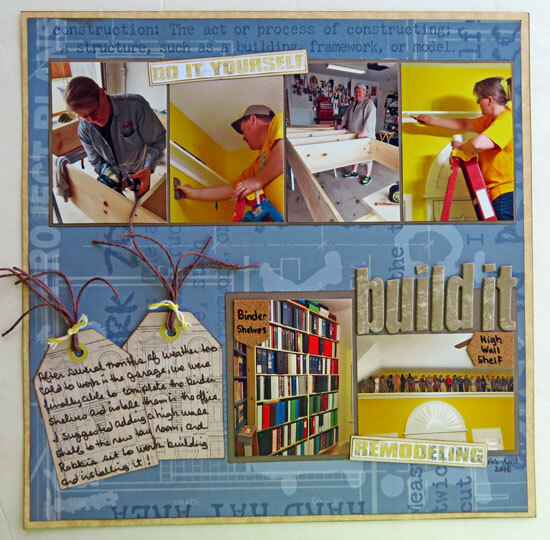 Shimelle's challenge for Day 6 in The 20 Project class was to let Pinterest help (and not hinder) in the scrapbooking process. 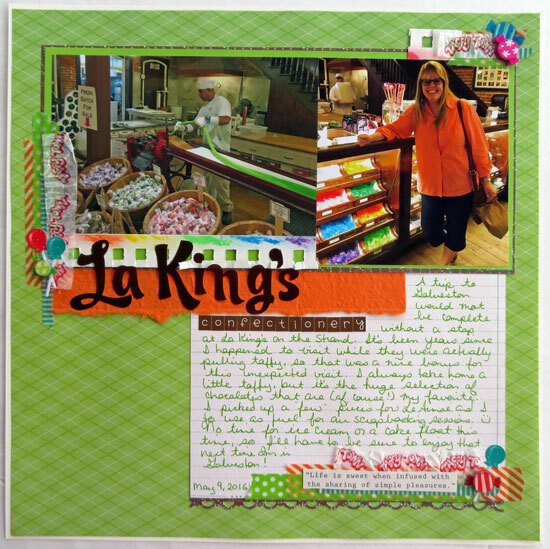 She gave herself a short time to look for INSPIRATION, then created a layout using the sketch she chose. Rather than scroll Pinterest myself, I simply used the same sketch that Shimelle used for her sample layout. The sketch showed two smaller landscape photos, however I used one 6x4 photo that arrived with a recent order of photos from Shutterfly . . .
and one 5x5 square photo that I'd printed at home as part of a collage of photos from this day. 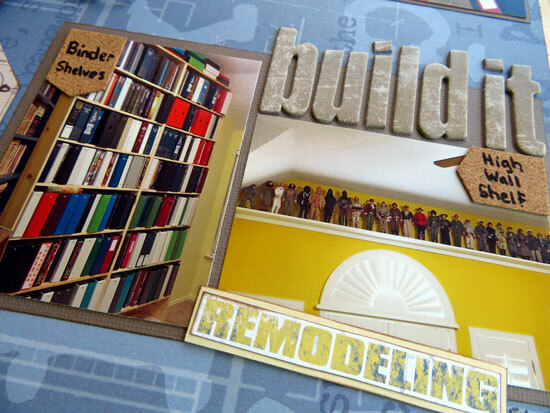 I included three embellishment clusters and used two different letter stickers for my title. 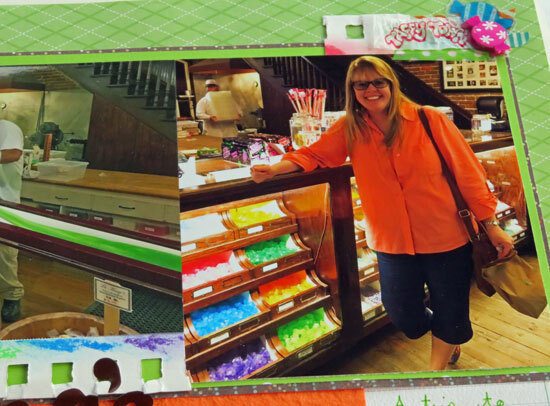 The lined patterned paper worked perfectly for my journaling about this great soda fountain & candy shop in Galveston! 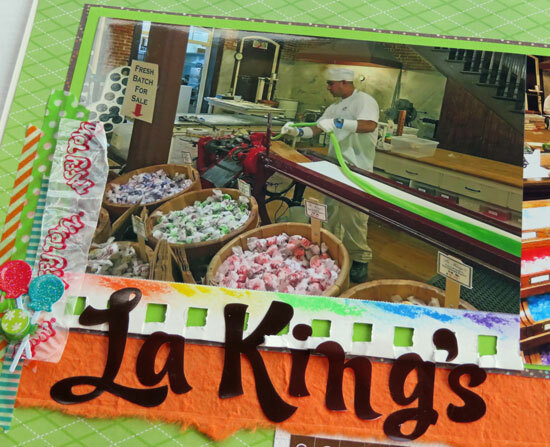 Do you have a favorite candy shop that you like to visit while traveling? 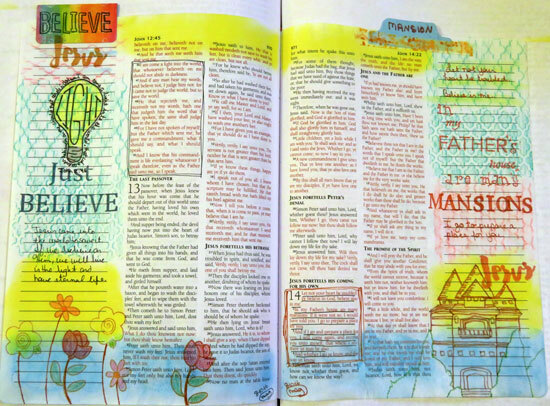 As I mentioned in last Sunday's post, I've spent time recently completing pages in the Bibles I use for demonstrations in my Illustrated Bible Journaling Workshops. The best part of this process is getting to spend lots of time in the Word. I take time to read the scriptures on the pages I'm completing, then work on the page as I contemplate the journaling and illustrations. Here's just a sample of some of the pages I completed this past week in the Bible we use for display at Personal Scrapbook. 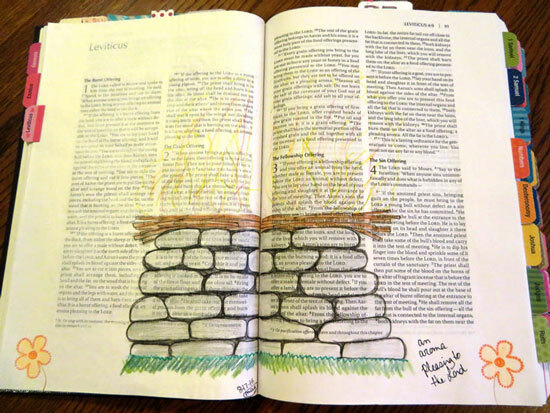 Leviticus 1-4 ~ An aroma pleasing to the Lord. 2 Timothy 1:9 ~ He has called us to a holy life. 2 Kings 19:15-19 ~ You alone are God. Psalm 57:3 ~ God sends forth His love. Psalm 9:1 ~ I will give thanks to the Lord with all my heart. It's Day 11 in The 20 Project class, however I'm a little behind and just completed a layout based on Day 5's challenge to choose a color from my photos, then use a color wheel to determine the remaining color(s). 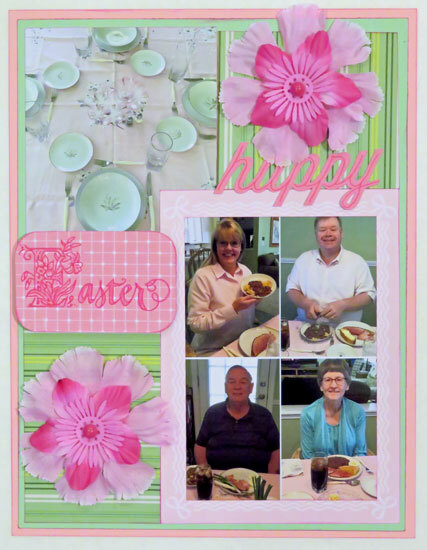 I chose pink to go along with the few photos I have from Easter Sunday dinner earlier this year, and added the complimentary color of green based on the color wheel. I'm enjoying using these challenges to get some of this year's photos scrapped. Since I only had two photos (one of the table setting & a collage of the four of us that were here), I created an 8 1/2" x 11 page. I probably would not have chosen the green for this layout, but I really like the way it turned out. Do you use a color wheel when choosing colors for your layouts? A few weeks ago, I'd never heard of David Boudia. However, in the week or so leading up to the Olympics, a few headlines/posts about him and his synchronized diving partner Steele Johnson caught my attention. I read a comment from David Boudia where he basically said his identity is not that of a gold-medal Olympian, but his identity is in Christ. These two divers are Christians who are quick to point out that their hope is in God, not medals. Last week we watched as this duo won the Silver Medal in the Men's Diving 10m Platform Final, and once again, in their post-competition interviews reminded us that being a Christian is a far more important part of their lives. They were both, of course, extremely happy to win the silver medal and have worked and trained hard for this achievement, but I loved hearing them stand up for their faith in such a public setting. When I saw that David Boudia's autobiography, Greater Than Gold: From Olympic Heartbreak to Ultimate Redemption, was available (free for an honest review) from Booklook Bloggers, I immediately requested a copy. This easy-to-read book tells David's story from the time he set his mind on becoming an Olympian at the age of seven through the two years after he won a gold medal at the 2012 Olympics. It is an honest and straightforward account of how he spent most of his life striving after medals, selfishly believing that those things would bring him comfort, security, and fame. However, he often felt empty and reached a crisis point in 2009 (after competing in the 2008 Olympics without winning a medal). With thoughts of suicide entering his mind, he sought counsel with his diving coach at Purdue University, who led him to the Lord and a new outlook on life. David shares how in the following years he continued to struggle with selfishness and striving to win for the wrong reasons, yet he fought through those times and worked to put God first in his life. In 2012, he won a gold medal at the Olympics and the fame that followed was again a battle to remain grounded in the Lord. I thoroughly enjoyed his story and his honesty about the struggles he's endured (and often continues to battle) as he chooses to place God first in his life. I would definitely recommend this book. Did you watch the synchronized diving final and see the US duo win silver? I'm excited to have the July pages in my 2016 Gratitude Journal completed! Now that I have a good system down, these pages came together fairly quickly. I added my lists, journaling, and some bits & pieces of memorabilia to the first page. 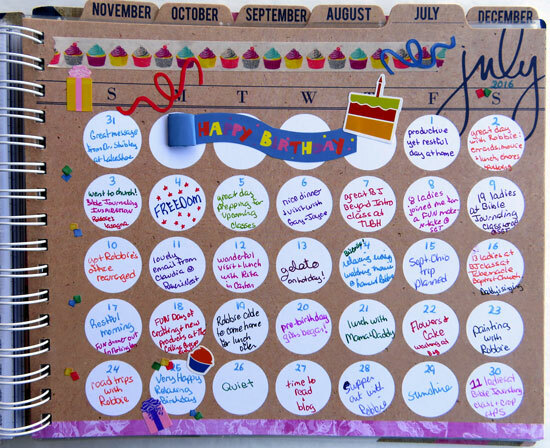 Since July is my birthday month, I used birthday themed stickers as embellishments. In the divided page, I included some photos as well as memorabilia. To complete the calendar page that holds my daily gratitude notes, I simply added more birthday themed stickers and washi tape. 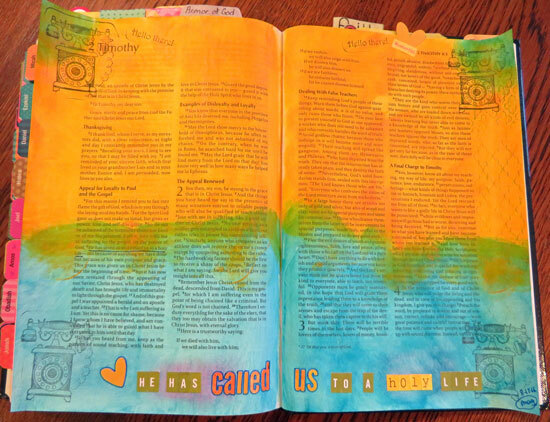 When I'm teaching illustrated Bible journaling, I demonstrate products and techniques in a variety of Bibles. This often results in some interesting looking pages! 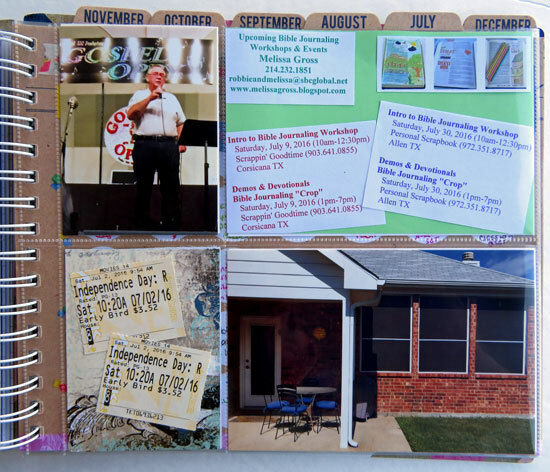 The page below is one that I started during a class at Scrappin' Goodtime. 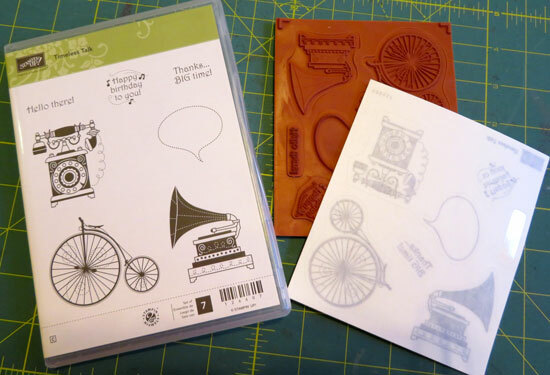 I was obviously demonstrating how to create backgrounds using Gelatos (along the bottom of the pages) and embossing folders (at the top). 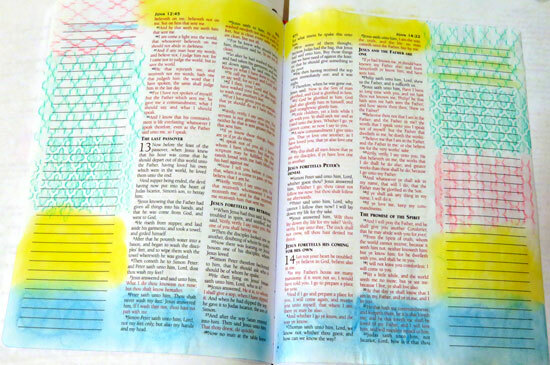 I am so thankful to have several Bibles to use for demonstrations, however I never want to leave these pages incomplete. 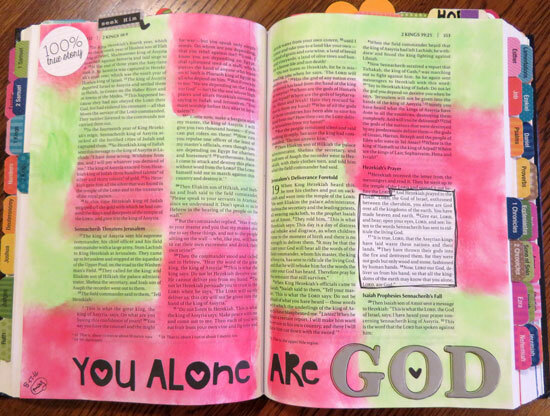 I want to honor God's Word, so every few weeks I work on these pages. I start with prayer and then take time to read the scriptures. In my example today, the text is from John chapters 12-14. I take some time to complete the background in my margins, which gives me time to think and pray about the scriptures I've just read. As you can see below, I simply used the same techniques and colors to create a border all the way around these two pages. 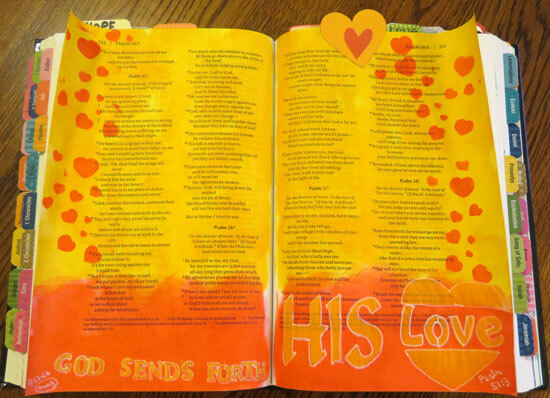 For the left page, I chose John 12:46-50 as my focus. In these scriptures, we are reminded that whoever believes in the Lord will live in the light and not in darkness. I drew a box around those verses, then traced a light bulb in the margin. 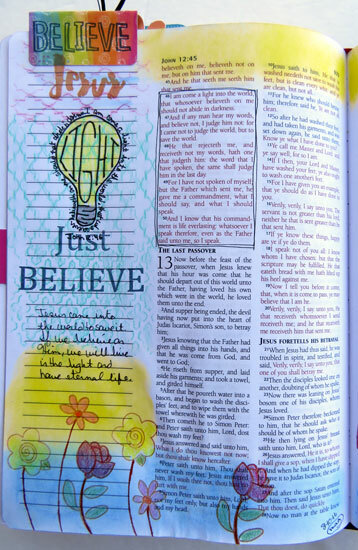 I wrote the words to verse 46 around the bulb and then stamped the words "Just Believe" below it. 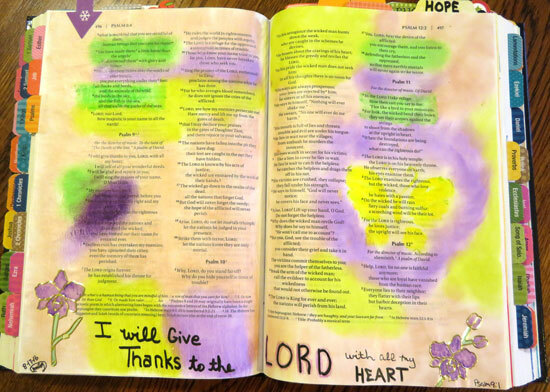 I included some handwritten journaling, then stamped and colored in several flowers to represent that the light brings life everlasting. I folded a 2x2 card in half to create a tab and added some additional stamping on it. For the right page, I chose to focus on John 14:1-4 where Jesus urges us not to be troubled but to believe in Him and know that He is going to prepare a place (a mansion!) for us. 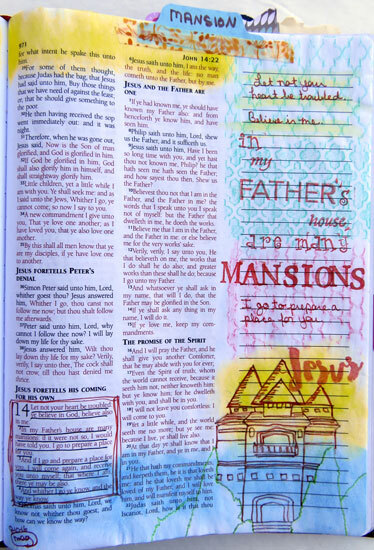 Once again I boxed in the scriptures, then added handwritten and stamped journaling, along with the drawing of a mansion (which I traced from a coloring page). I added a tab, the date and my initials to indicate that the page is now complete. I hope you've enjoyed this example of my process as I work to "clean up" and complete the sample pages I've used for demonstrations in my classes. I have to admit that I enjoy this time because it means I'm spending time in the Word, searching for nuggets of wisdom to illustrate and emphasize in my journaling. There's also lots of creative time in the process - a total win/win in my book! Yesterday was Day 4 in The 20 Project class and Shimelle's challenge was to use some of those "pristine" stamps in our collections. We know the ones, those stamps that are still pristine because we haven't used them yet! 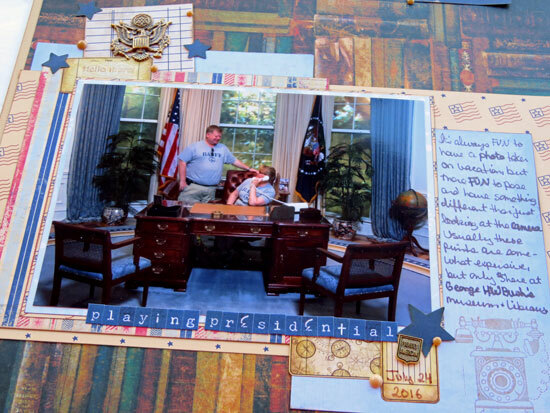 I pulled a 5x7 photo from our recent visit to the George H.W. 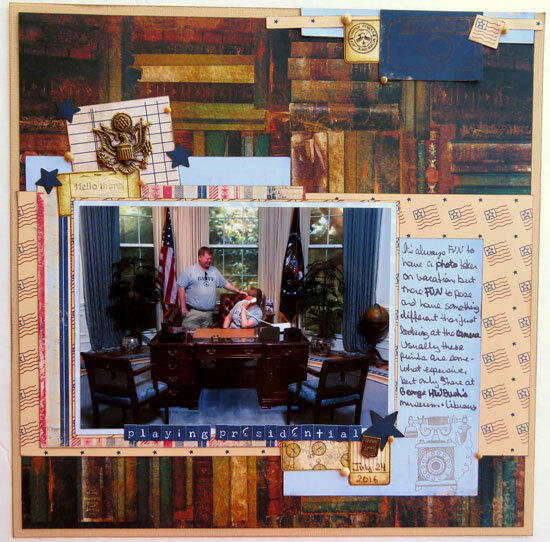 Bush Presidential Museum and was able to gather my supplies fairly quickly - a background patterned paper with books and some patriotic papers and embellishments. I used the telephone stamp in the bottom right corner and the "Hello there!" stamp on the label in the top left (it doesn't show up very well in the photo). 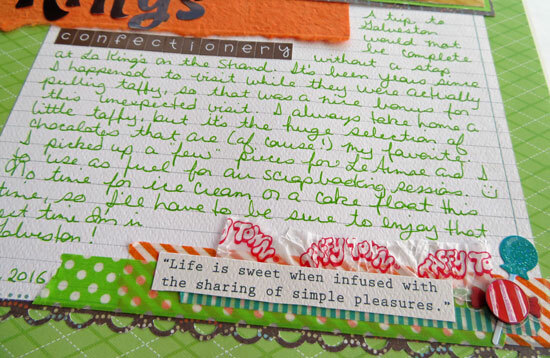 I also used another "pristine" stamp in the top right embellishment cluster. It's very subtle - a camera from the Shimelle collection. D you have any pristine stamps in your collection? It was a relaxing weekend around here, with lots of puttering around the house and one little outing to church on Sunday morning. It was a perfect weekend for watching the Olympic excitement and learning new things. We enjoyed the colorful opening ceremonies that gave an extensive history of Brazil, although it seemed to go on a long time (probably because we were watching it on delay here in the States and had to endure commercials as well). I learned (or actually re-learned something I should have remembered from my school days) that Brazil is the largest country in South America and 60% of it is rain forest. The portion of the ceremony warning against global warming, with the little boy wandering around and finally finding a plant, reminded me of a similar scene in the Wall-E movie. I was thrilled to learn that the nations were entering the arena in alphabetical order . . . in the Portuguese language, which meant the United States ( Estados Unidos) arrived much earlier than usual in the program . . . and we were able to get to bed at a decent hour, despite having to miss the torch lighting. We also missed the Olympic Refugee Team, which is a first for this year's Olympic games, but I saw later that they received a standing ovation. As the weekend progressed, I also realized that there are a good many sports that I didn't know were part of the Olympics. In fact, the the first US gold medal was won in shooting! I tend to watch just a few favorite sports, so I missed the medals the US has also earned in archery and fencing. However, I did watch live swimming as Katie Ledecky won her first 2016 gold medal in the Women's 400m Freestyle race and Michael Phelps racked up his 19th Olympic gold as part of the Men's 4x100m Freestyle Relay team. And I enjoyed watching the US Women's Gymnastics Team rank first in the qualification session yesterday. For the first time ever, this weekend we watched several beach volleyball games. This year Olympic beach volleyball is being played on the sands of Copacabana beach, a real beach, not a makeshift beach created for the Olympic games. Saturday night was the first ever midnight Olympic beach volleyball game! Luckily it was a weekend night and Brazil is two hours ahead of us, so I was able to watch as Kerry Walsh-Jennings and April Ross crushed the Australian team. 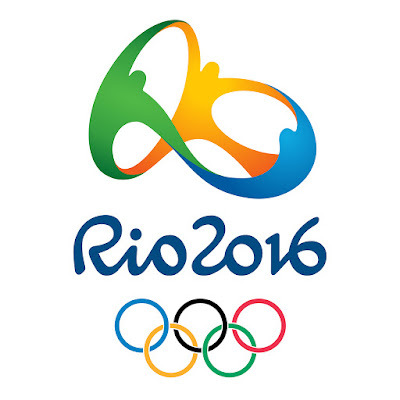 Have you been watching the Olympics? What interesting things have you learned along the way? Joining in today with Sian, a wonderful raconteur, for her Memorandum Monday meme sharing something NEW (something you did over the weekend FOR THE FIRST TIME or something you learned and DIDN'T KNOW BEFORE). The Day 3 challenge in The 20 Project class was to try more with ink. The idea was to try something new or use some inks that we don't normally use. 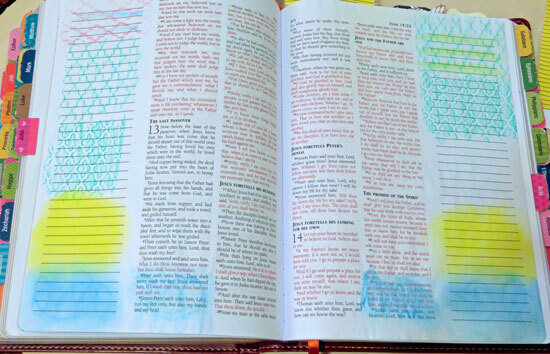 I often use my Powder Puff chalking inks to chalk the edges of my papers for layouts as well as for stamping in my Bible journaling. However, I don't often stamp on my layouts, so I decided to use a couple of my Dew Drop Memento inks, a background stamp, and two accent stamps on a page. 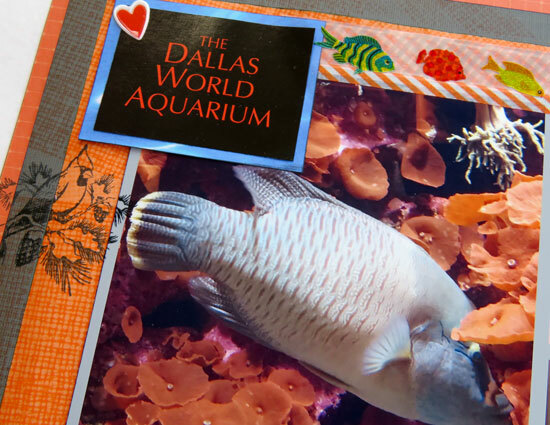 I had a printed collage of photos from our visit to the Dallas World Aquarium, so I started with that and pulled papers and a few embellishments. 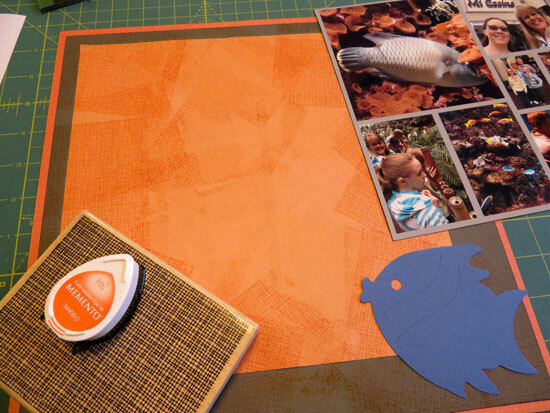 I stacked three papers for my background, then stamped over them to add texture to somewhat mimic the coral in one of the large photos in my collage. I offset the papers because I intended to use a blue fish die-cut for my journaling. 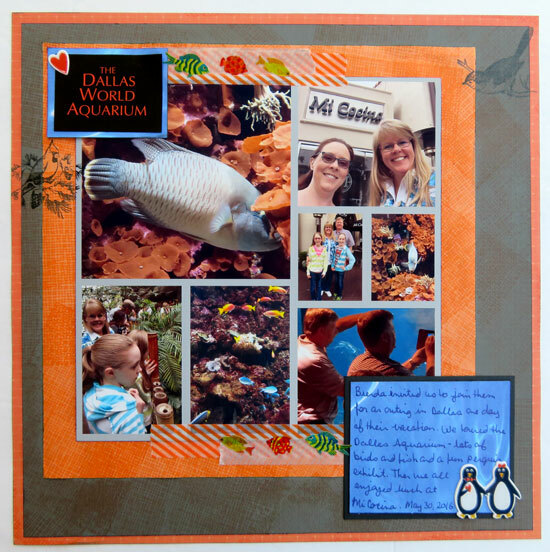 Once I had the collage, title block, and fish die-cut in place, I wasn't happy with the fish and ended up replacing it with a square journaling block. I added two bird stamps on the page because there were lots of birds at the aquarium, but that fact's not really represented in my photos. I also included some fish and penguin stickers. Honestly, this is not one of my favorite layouts. I probably would not have used the blue if I had not started with that blue fish die-cut, however I'm happy to have these photos and memories recorded and in our 2016 chronological album! It's Day 2 of The 20 Project class, and Shimelle challenged us to try a different title technique. For example, she normally uses large Thickers and small letter stickers for titles, so today she created a watercolor title. 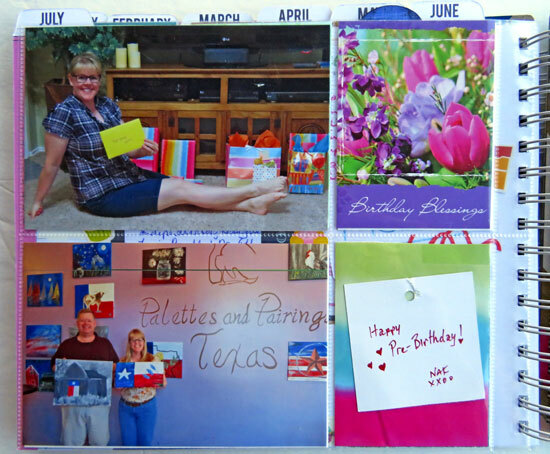 Along with scrapbooking this month, I'm working on processing my digital photos from this year. I'll be uploading a batch of photos to Shutterfly for printing, however I'm choosing some shots to print at home as I use the class INSPIRATION to create layouts. Today I printed six 3x4 photos of the shelves we built and installed earlier this year. 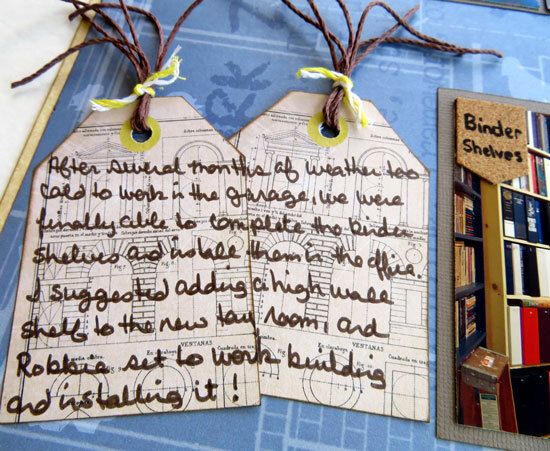 I used a couple of tags as a journaling block and finished them off with jute and twine. When you need another shelf, do you build it or buy it?